Leicester City’s incredible season is being heralded the greatest sporting story of all time. A team of misfits and rejects has done the unthinkable and won the English Premier League. In August 2015 they were dismissed as relegation fodder. The pundits, experts, former players and commentators predicted a season of pain. A season that would ultimately end in humiliation and relegation. Move forward to 2nd May 2016 and they have done it. Tottenham’s failure to beat Chelsea at Stamford Bridge gave Leicester City victory with two games still to play. So how can this have happened? How have the ultimate underdogs confounded the game’s wealthy elite to be crowned champions of the richest league in the world? Let’s remember, this is a team whose entire match-day squad against Liverpool earlier this year, cost less than just one of their substitutes. A team who were 5000–1 outsiders to win the title, a team that all logic and sense tells us – this simply can’t happen — but it has. This is not only the greatest sporting story all time. This is one of the greatest stories of all time. It is the ultimate tale, one to rival Shakespeare’s Romeo and Juliet, Hemingway’s The Old Man and the Sea or Francis Ford Coppola’s Godfather films. What makes it so fantastic is not only how unpredictable it is — but how it has an uncanny way of following the perfect narrative arc of storytelling. All great stories follow pretty much the same structure and principles. The beginning or hook, drawing the audience in. This leads onto the main body of the story and the rising tension, developed by creating conflict and resolution. This builds to a climax, followed by the final resolution and conclusion. The quality of the story then rests upon how unexpected it is. The greater the challenge and the greater the adversity, the better the story. It certainly has all of this — in spades. Take for instance Riyad Mahrez. The poor Algerian kid from the tough Parisian suburb of Sarcelles. He was plucked from the lower divisions of French football for a mere £400,000 and has taken the premier league by storm. His sublime skill and goals have destroyed footballing aristocracy all season — putting the likes of Chelsea and Manchester City to the sword. He’s now being valued at anything up to £60m. 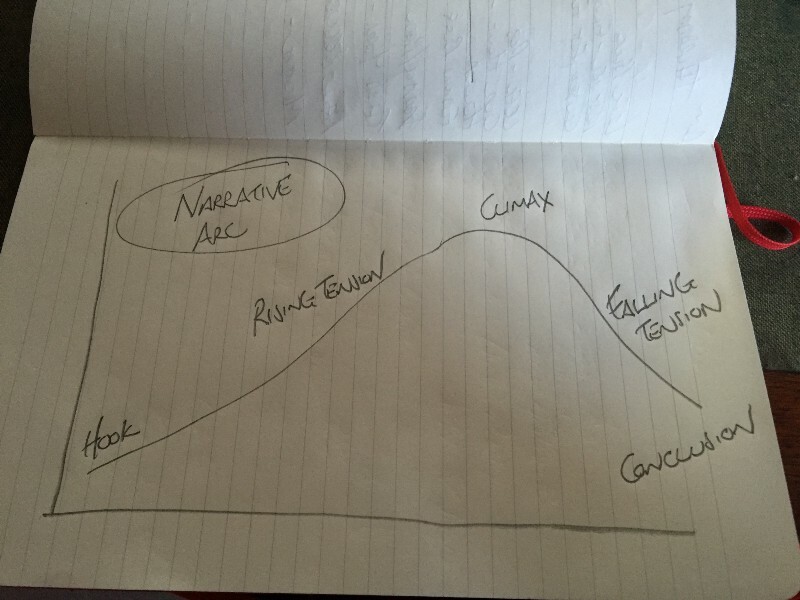 If we de-construct Leicester’s season we can see how the narrative arc works so beautifully. We are immediately grabbed by the Leicester City story, because of the club’s incredible end to the previous season. With nine games to go they were bottom of the league, seven points from safety. To any sane observer they were going down. But somehow they put together an amazing run of results and managed to avoid relegation. Statistically it was the greatest escape in Premier League history. The eyes of the world were well and truly on Leicester. So the attention, the draw is there. What’s needed now is some conflict to build the tension. We were not to be disappointed. Next up the manager, Nigel Pearson, the man who orchestrated the club’s end of season form, is sacked. Cue much dismay from the Leicester City faithful. He is replaced by Claudio Ranieri, a man who was dismissed as manager of the Greece national team, after they lost to the Faroe Islands — yes the Faroe Islands. The appointment is not welcomed by all. Then — to make matters worse, the star player and talisman — Esteban Cambiasso leaves the club and signs for Olympiakos. Incredibly — when the new season starts, Leicester continue where they left off. They just keep winning. This in many ways is epitomised by the home game against Aston Villa. They come from 2-o down to win 3–2 in the final few moments of the match. Early season joy takes a bash when they are battered 5–2 at home by Arsenal, but they keep bouncing back. At this point an almost equally unbelievable subplot emerges. Jamie Vardy goes on his record-breaking goal scoring streak. He scores in eleven consecutive Premier League games and gets called up to the England squad. This is a striker, who five years previously, had been playing for Stocksbridge Park Steels, in the seventh tier of English football. As a teenager, he was released by Sheffield Wednesday, got into trouble with the law, worked 12 hour shifts in a factory and played wearing an electronic tag. He often had to miss to second half of games, to get home in time for his curfew. Unsurprisingly there is now talk of the Jamie Vardy story becoming a hollywood movie. The season develops into a cat and mouse chase between Leicester and the teams around them. Leicester going top — only to be pegged back by Manchester City, Tottenham Hotspur and Arsenal. Meanwhile, there is a strange and emotional realisation amongst the Leicester City fans — that this could really happen. This was encapsulated superbly, by a tearful supporter who phoned into the BBC radio phone-in programme, 606. As the games go by, Leicester continue to get through so-called difficult spell after difficult spell. But then it looks as if they slip up. They concede a dramatic last minute goal against the mighty Arsenal, to give their rivals victory. The gap is closing and the race for the title wide open. Leicester come back again, they put together a winning streak, securing the riches of champions league football. We enter the final few games of the season and they are stretching their lead. A win over Sunderland puts them ten points clear of Tottenham — by now their only genuine rivals for the title. Tottenham win their next game to cut the lead to seven points. West Ham are next up — if Leicester win — they are almost certainly champions. But a good story would never allow this to happen. The controversial game ends in a two-all draw, with Jamie Vardy being sent off and subsequently banned for two games. Tottenham win their next match 4–0 and it’s game on for the title. With the talismanic Vardy out — how on earth could Leicester continue this form? But they do — Vardy’s replacement Leonardo Ulloa scores twice as Leicester comfortably beat Swansea 4–0. Then to the delight of all Leicester supporters, Tottenham draw their next game and all but hand the title to Leicester City. Leicester go to Old Trafford, the theatre of dreams, to take on Manchester United. They can win the title here, at the home of one of the biggest clubs in the world. It is not to be. A 1–1 draw prolongs the agony for Leicester City fans. But then Tottenham travel to Chelsea. The first half goes badly from Leicester’s point of view. Spurs lead 2–0 at the break, but then Chelsea fight back. A bad tempered game goes to 2–1 and then in the last few minutes Eden Hazard scores an absolute beauty to draw level. The final score is 2–2. The rest of the season provided the falling tension, ultimate resolution and conclusion. The title and trophy was presented at the King Power Stadium on Saturday 7th May, after the last home game of the season against Everton. This was followed by the most incredible scenes, as 250,000 people took to the streets of Leicester and Victoria Park to celebrate this most incredible of stories. The narrative of this story works on so many levels. The drama of the season. The small club taking on the big boys and winning. The triumph of the team ethic over the finances of the wealthy elite. The way the charismatic manager has taken a handful of players and made them so much greater than the sum of their parts. Each of them has a poignant story to tell. Claudio coming back from being sacked at Chelsea to inspire and entertain us throughout the season. Danny Drinkwater and Danny Simpson — both dropped by Manchester United. Jamie Vardy, non-league striker to England star. Robert Huth dropped by Stoke, Marc Albrighton unwanted by his boyhood club Aston Villa and picked up by Leicester and big Wes Morgan, the journeyman skipper, who was told to lose two stone in weight, to get a chance at professional football. This is a tale to match any other. One of high drama, excitement, triumph over adversity, where the genuine underdog does prevail. At this point I do need to declare an interest. I will admit to being somewhat biased. I am a Leicester City fan and season ticket holder. I’ve had the joy of witnessing this incredible story first hand, along with my two teenage sons. Sport has an incredible power — every football, rugby, cricket, cycling, athletics or tennis fan will tell you it conjures up emotions, they find impossible to put into words. I have felt this way since I went to my first game at Filbert Street 36 years ago. It was a one — nil victory over Chelsea. I was eight year old, standing in the terraces with my mate Richard Hunt and his dad Roy. When Leicester scored I’d never experienced anything like it. The raw emotion, screaming, crying, the way you were thrown around by the surging mass of the crowd — the exhilaration. Since then I have been hooked. It is impossible to explain or justify why I feel the way I do. The anxiety before a match, the morose gloomy mood if they lose or the sheer joy and delight if they win. Life as a Leicester City supporter has never been easy. It has essentially been a painful experience, with the odd explosion of joy at getting promotion, or winning the League Cup. This has made up for it all. I wanted to end by putting it into context. I clearly had my tongue firmly in my cheek, by suggesting it’s the greatest story of all time — but think on this. At the beginning of the football season a few optimistic fans got odds of 5000–1 on Leicester winning the title. Today you can get odds of 2000–1 on Elvis being found alive, while the discovery of the Loch Ness Monster is 500–1. Imagine if either of those happened? Wouldn’t that be the greatest story of all time? Previous PostCan online video save the local press? © 2019 2020 Media International.